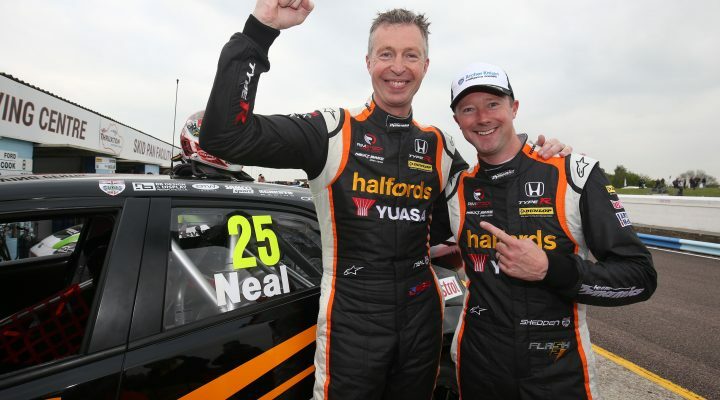 Halfords Yuasa Racing’s Matt Neal has claimed his first Dunlop MSA British Touring Car Championship pole position in nearly five years after setting a qualifying lap record at Thruxton. The triple champion hauled his Honda Civic Type R around the 2.356-mile circuit – the fastest track in the country – with supreme style to claim top spot ahead of his team-mate Gordon Shedden. Neal had set the early pace before getting loose on the following tour, initially scuppering his chances of further improvement. On his ultimate lap, the experienced racer also locked up slightly going into the final chicane, but the stellar effort was still enough to grab an historic pole position – his first since Croft in 2012. Jack Goff and Tom Ingram were at the top of the order mid-session, though the young duo eventually had to settle for third and fourth respectively. Eurotech Racing’s Goff had been on the pace throughout the day and the 26-year-old made it a one-two-three lockout for Honda machinery, whilst championship leader Tom Ingram also produced heroics in his ballast-laden Speedworks Toyota. Handy Motorsport’s Rob Austin proved the potency of the Avensis by claiming fifth, backing up his own pole position at Donington Park last time out. Austin has shown speed throughout the 2017 season so far but has been caught up in a number of unfortunate incidents on race day – a factor he will be looking to overcome tomorrow. Jeff Smith had a wild ride to sixth, which included a session stopping accident on the exit of Allard. The Eurotech man had already set a solid lap time before running wide on the opening turn, resulting in his Honda car sliding across the grass and into the barrier. Ciceley Motorsport’s Adam Morgan surged to seventh in his Mercedes A-Class, while Ashley Sutton continues to fly the flag for Adrian Flux Subaru Racing as the young gun claimed eighth. Team BMW endured a challenging session overall with Colin Turkington’s ninth place the best result on the day for the Bavarian marque. Mat Jackson brought his Team Shredded Wheat Racing with Duo Ford Focus around in tenth spot – a high for a Motorbase-backed car on a Saturday this year. Tom Chilton, who showed strong pace, dropped from eighth to 11th after a post-session penalty for failing to slow under yellow flag conditions. A host of famous faces had to settle for places outside of the top ten with the top 21 cars covered by less than a second. Such is the competitiveness in the series this season that it was double champion and BTCC legend Plato in that 21st position, just 0.999s behind Neal’s benchmark. Three thrilling BTCC races are expected at Thruxton tomorrow with the entire race day being broadcast live and exclusively on ITV4 from 11:15.